If you’ve ever formally studied a language in school, you’ve probably dealt with the usual awful assignment: Copy each of these vocab words/phrases x-times in insert target language and x-times in insert native language. Well, that’s great. You memorize the word for the test and then promptly forget it. So what’s the point in memorizing for a test? This is language-learning; hopefully you’re remembering for life. But memorization isn’t all bad. Go ahead and memorize – just remember that the point is to keep remembering, so memorizing it in one sitting isn’t going to do any good. You have to keep using the word, keep practicing it in conversation, writing, listening, etc. 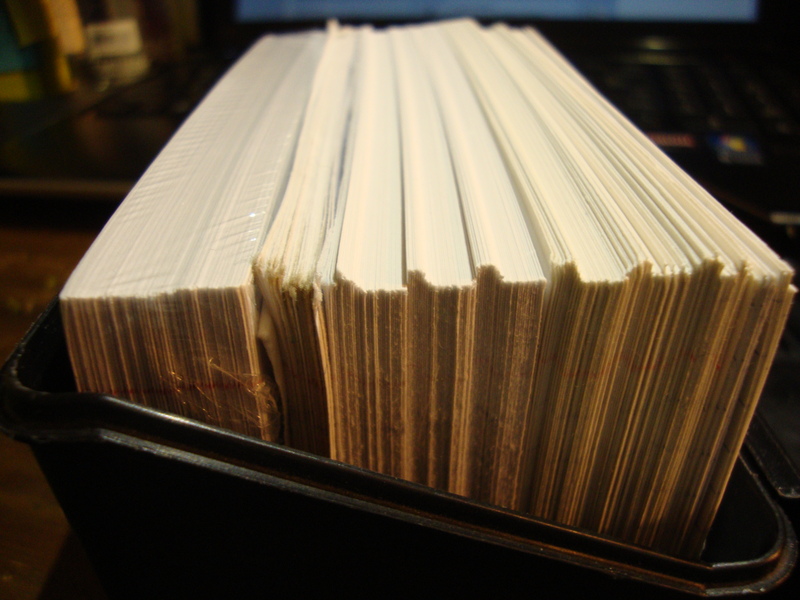 This is how I feel when I’m using new vocabulary. For the summer, I’m coming up with a vocab learning plan. It might not pan out exactly as follows, but here’s what would be awesome for my Korean self-study (if it works). Sticky notes: I have far too many of these, too, and even though I use them for putting random notes to myself all over my desk or scribbling down Korean phrases for quick reference later (also putting these all over my desk), I still seem to have a bazillion or at least a couple hundred of these. I’m using these on verb vocab cards – I put the Korean infinitive on the blank side, its translations on the lined, and the present, past, future and sometimes adjectival conjugations underneath a sticky on the blank side. That way I can not only quiz myself on the translations but also the conjugations – because what’s the point in knowing only the infinitive? 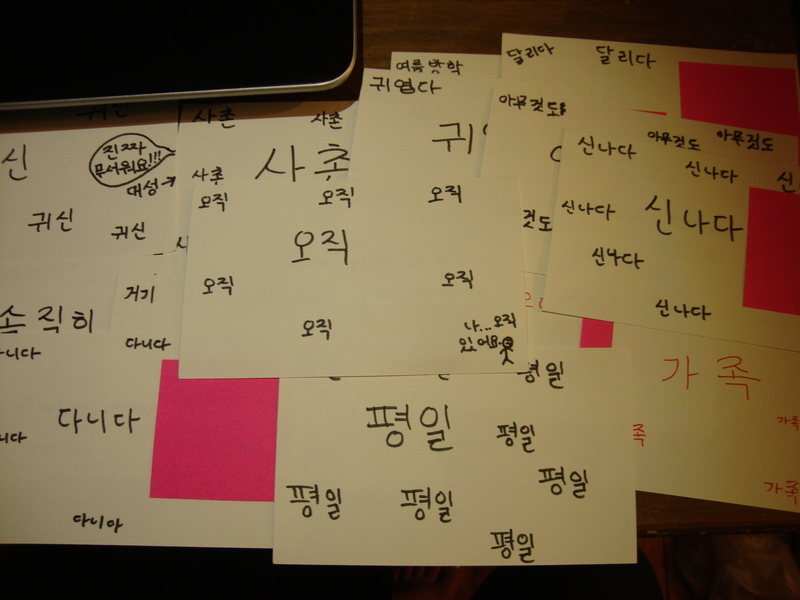 As I’m learning these words, I’m coming up with sentences using them (sometimes writing them on the cards, sometimes saving them on my computer or scribbling them down in my Korean notebook (great site by the way, but no relation to the huge notebook I keep for language studies). I’ve also made sure to use them in my replies to my language partner – and so far, I’m remembering a small but useful amount of new vocab. Other ways I learn/reinforce vocabulary are through watching dramas and looking for familiar words/phrases, reading song lyrics while listening to the song (I suggest going on YouTube and watching lyric videos for your favorite Korean songs), and attempting to read random news articles on Naver. Here’s the MV; support the artist! hey, i usually listen kpop songs, which i love and then carefully study every single word and meaning in rom/han/eng. of course it works just with the songs i love and listen to them everyday in order to speak/sing my fav lines later by heart. Besides that, I’m a shawol and elf, so I also watch every variety shows they participate in. It helps me a lot, because the most common phrases usually repeating and i guess it’s impossible to forget them haha! oh and finally, i watch korean lessons on youtube/ learn from korean grammar sites and carefully write down to my notebook. I would also suggest that you go to talktomeinkorean.com and look at their vast array of free resources and lessons. They’re my number one method of learning grammar and they’re lots of fun/make lessons interesting! Mmmhm, Roy Kim has such a lovely voice^^ 감사합니다 for telling me about your study methods! ㅎㅎ The wall at the back of my desk is covered in sticky notes. Writing down phrases and vocabulary helps me remember better. 저도요 ㅎㅎ I signed up for memrise but I haven’t really use it at all…maybe I’ll try it out now! The topic on 하지마 and 가지마 was really helpful! I felt the same way about memrise *until I got the app*! Seriously, being able to drill my vocab in my spare time on my phone is really helpful.